Is Lasik Laser Eye Surgery Right For You and Your Budget? So you're sick of popping in those contact lenses every day. Or taking them out and cleaning them when all you want is to fall into bed at night. And while you haven't been called "four eyes" since fifth grade, you're just done with the bespectacled look. Now you're considering Lasik laser eye surgery -- but is the price eye-popping? To help you decide if this procedure is really for you, WalletPop compared the costs and sight improvements of laser eye surgery vs. a lifetime of contacts and glasses, and asked some experts to shine a light on the procedure. Laser-eye surgery, also called refractive eye surgery, is designed to correct or significantly improve your vision. According to The American Academy of Ophthalmology, the procedure adjusts the eyes' ability to focus by reshaping the cornea -- the clear, round dome at the front of your eye. Experts say the most widely performed refractive surgery is Lasik ("laser assisted in situ keratomileusis"). With Lasik, an outpatient or same day procedure, a surgeon creates a flap with a laser. The flap is then folded back, and the doctor uses a second laser to resurface the cornea to reshape it and change your vision, explains Dr. James Salz, a board certified ophthalmologist who specializes in laser eye surgery. According to Dr. Salz, the procedure causes minimal discomfort, and your vision should be improved by the following day. The best candidates for Lasik surgery -- the people who will experience the most dramatic and successful results -- are nearsighted people between the ages of 25 and 40. These people are bothered by blurriness when doing everyday things like driving a car or watching a movie and playing sports. This group currently makes up about 80% of those who undergo the surgery, Dr Salz told WalletPop. For the most part, nearsighted patients who undergo Lasik eye surgery will enjoy "good distance vision their whole life," Dr Salz says. With farsighted people, the procedure is designed to produce a steeper cornea. If you're farsighted, however, Lasik eye surgery will produce less dramatic results than it will for nearsighted people. The best candidates for farsighted Lasik surgery are people in their 40s, 50s and 60s who have found that both their near and far vision has become blurred. This group of people, about 20% of Lasik surgery patients, have the surgery to create monovision, Dr. Salz says, "where one eye is set for clear focus for [distance vision], and another eye is focused for reading." The surgery will eliminate the need for glasses for such things as reading a menu or using your cell phone, adds Salz, "but you might need glasses for prolonged reading tasks." So if you're thinking about undergoing eye surgery to get rid of your reading glasses for good, think again. According to Consumer Reports Health, 71 percent of survey respondents between the ages of 40 and 54 years old still had to wear glasses after laser eye surgery. It's important to point out that there are certain people on whom the surgery should not be performed, including those with diseases like lupus and diabetes, people with dry eyes, and women who are pregnant or breastfeeding. To find out if you might be a good candidate for laser eye surgery, consult The American Academy of Ophthalmology's report on questions to ask when considering surgery. 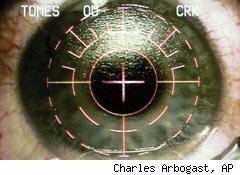 You can also take this short test on AllAboutVision.com to help determine if the surgery is right for you. So how do the results from Lasik surgery stack up against contact lenses and glasses? Your vision post-laser surgery will mostly match the sight correction you get from wearing contacts, Dr. Salz says. But if you're correcting for farsightedness, your post-laser surgery vision will surpass the sight correction you get with glasses, he says. As with all surgeries, laser eye surgery has its risks, although the procedure's overall complication rate is low, according to the American Academy of Opthamology. With laser surgery, one of the biggest risks is an eye infection, which can lead to a scarred cornea and vision loss. Some people experience such side effects as dry eyes or see halos around lights that should fade over time. A qualified and experienced surgeon should be able to anticipate if a laser eye surgery candidate will be prone to these side effects and discuss their possibility in the pre-surgery discussion phase, Salk says. Because research shows that the surgeon, rather than where the surgery is performed, is the best predictor of the surgery's success, doing your homework to find a well-qualified, experience surgeon should be your first order of business. Consumer Reports Health suggests looking for a board-certified surgeon who has performed the procedure at least 250 times and who uses equipment approved by the FDA. What's more, Dr. Salz suggests, "You should ask an eye doctor who doesn't perform laser eye surgery for [surgeon] recommendations," and then get the opinions of at least two different surgeons before selecting one. • Visit the American Academy of Ophthalmology's website, where you can use the "Find an Eye MD" feature. Be sure to specify "refractive surgery" under "specialty." • The American Society of Cataract and Refractive Surgery (ASCRS) also offer an online membership list and a "Find a Surgeon" feature. • TrustedLasikSurgeons.com offers a list of what it calls the best and mostly highly qualified surgeons in the U.S., including ones who've been handpicked by laser manufacturers to conduct FDA studies. While the cost of the surgery will depend on where you have the procedure done, the average price for all laser-based vision correction procedures, including Lasik, is $2,150 per eye, or about $4,500 for both eyes, according to information from AllAboutVision.com. However, newer technology may increase the procedure costs. • While laser eye surgery isn't typically covered by health insurance, you should still check with your insurer to see if your health plan covers all or part of the costs, according to Consumer Reports Health. Because some laser eye surgery providers have negotiated discounts with larger insurance carriers and vision networks, you might also be entitled to a 5% to 15% discount, depending on your insurance coverage. • If you're not covered, see if any complications from the surgery would be covered, Consumer Reports Health advises. • You should also find out if your employer's flexible spending account can be used to pay for laser vision surgery. These tax-advantaged accounts are funded through your tax-free payroll deductions and help pay for health expenses not covered by your health plan. • Look into financing options. Many laser eye surgery centers offer free financing for 12 to 24 months, as well as special discounts, Schuler Adair says. • Consult the Healthcare Blue Book, "Your Free Guide to Fair Healthcare Pricing," to get cost information on Lasik pricing and helpful "buyer-beware" type guidance. How does the cost of Lasik eye surgery compare to the price of a lifetime of contact lens wearing? The price of wearing contact lenses is an estimated $300 a year, which includes the contact lens solution but excludes office visits, Dr. Salk estimates. Some health insurance plans include vision coverage, which can bring the cost down for many people. According to Consumer Reports Health, the price of a box of lenses (which typically includes six lenses) at retail chains ranges from $25 at Costco for SofLens Toric lenses to $69.99 for Night & Day lenses from LensCrafters, with most prices hovering in the $35 range. So let's do a rough cost comparison to see whether paying $300 a year for contact lenses is a better bet than than the one-time cost of approximately $4,500 for Lasik eye surgery. After doing the math, the price a nearsighted person will pay for about 12 years of wearing contacts -- after you factor in the cost of doctor visits -- will just about equal the price of the surgery, Dr. Salz estimates. So the savings from the surgery for those patients who will, by and large, enjoy a lifetime of good distance vision will "really start to kick in after the first decade," Dr. Salz says. And although most patients will need reading glasses when they hit middle age, Dr. Salz says, "You can get over-the-counter ones for $20." If you're an eyeglass wearer who's considering Lasik, keeping your spectacles is, for the most part, the less-expensive option. Let's do the math and see what you'd save. So let's say a person buys 15 pairs of glasses over a lifetime at $240 a pop: That's about $3,600 in glasses vs. $4,500 for the Lasik surgery. Of course, for those nearsighted people who want to kiss their glasses goodbye for good, it just might be worth it. It all depends on how you--well--see things.